Today we cover a trade idea in IYR. There are several factors that went into this trade idea and we cover each one of them in detail on why this trade matches my risk profile. Want to learn the most powerful trading habits one can develop? How about 39 of them? Now you can get your hands on Trading Habits: 39 of the World’s Most Powerful Stock Market Rules with this link: https://amzn.to/2IydCBm . Steve Burns put together the book he says he wish he could have read when he was learning to trade. Rule 21 absolutely blew me away and I think could be the difference between a successful and unsuccessful trader. Also, don’t miss 50 Moving Average Signals that Beat Buy & Hold: https://amzn.to/2H1iu0d that we discussed in this interview. Theta is the time value of an option. It will decay to zero over time from now until expiration, this applies to every strike on every stock. But, how is that like an insurance policy? Tune in to learn how they work nearly the same! Learn how to take the guesswork out of trading and get your free 2 week trial and 50% off your first month after that by using code 10MINUTE at Finclub.ai Ready to get your loot crate full of free 10 Minute Trader Exclusive Bonuses? Just head over to tastyworks.com and create your free account using code 10MINUTE then send an email to contact@10minutestocktrader.com and you’ll get over $150 in free bonuses from 10minutestocktrader.com. It doesn’t get any easier than that! Delta is by far the most useful Greek to help measure not only risk, but reward and exposure. It is the first thing I look at on every single trade and I’ll cover 3 ways to use Delta when trading options on today’s podcast. Learn how to take the guesswork out of trading and get your free 2 week trial and 50% off your first month after that by using code 10MINUTE at Finclub.ai Ready to get your loot crate full of free 10 Minute Trader Exclusive Bonuses? Just head over to tastyworks.com and create your free account using code 10MINUTE then send an email to contact@10minutestocktrader.com and you’ll get over $150 in free bonuses from 10minutestocktrader.com. It doesn’t get any easier than that! Today’s podcast is on how to trade earnings. We are taking a deep dive as we prepare for the upcoming Earnings season and give you all the tools, tips and tricks you need to know for trading earnings! On today’s podcast we cover three ways that I have found help a person to be a better trader today than they were yesterday, and a better trader for tomorrow. Want to know Allison’s take on The Best Way to Trade Any Market? Be sure to tune in today and learn her 25% rule and a low risk high reward strategy to profit using butterflies. Today we have Raghee Horner from Simpler Trading on to discuss the consequences of the yield curve inversion. Does this mean we will have a recession? What’s going to happen in the near and long term? Join us today as we go in depth on the yield curve and also talk about the “Reflation Trade” Raghee sees on the horizon. 8,000 downloads in a single day!?!? Hey guys, thank you so much for being listeners of the podcast. Yesterday was incredible with the HUGE volume that came through! Thank you to all the new and old listeners for continuing to put your trust in me and for listening to the podcast! Have you ever been in an options trade that you just needed more time in order to make it work? Options have a defined end date but by rolling them out in time, you can extend the termination of the contracts for as long as you want. On the Tastyworks platform, that process couldn’t be any easier and today I show you exactly how easy it is! When Should I Deal With a Trade Gone Wrong? On today’s podcast we discuss how having already defined your risk tolerances and trading plan before entering a trade can help you determine the best time to deal with a trade gone wrong. There’s no cure-all but there are lots of ways to plan and prepare for a trade that hasn’t worked out. Why Cash is King when it Comes to Trading Stocks and Options. It may come as a surprise to some people, but a trader’s best friend is having cash on hand. Cash is king because it is a risk free trade, you can’t lose money if the market goes down in cash and by having cash available, you can make more trades. But having the security of your assets in cash can make a much better trade than one that is losing money. Today I go over my morning routine that I use to block out the noise and focus on what matters to me and setting up my trading day for success. I am so excited to share my first interview with Dr. Jim Schultz of Tastytrade. He could be one of the smartest guys I know. Be sure to check him out daily on tastytrade.com to learn more about finance and trading and also check out his site livefcubed.com for the full details of the fat loss formula mentioned in the episode! We just hit 55 thousand downloads! Thank you so much for being a listener of the podcast. I cannot express how truly grateful I am that I can be a part of your day! Today we talk about a different topic than usual, how the internet can completely change your life. I talk about Jack Canfield’s Success Principles, https://amzn.to/2TAmInb and Gary Vaynerchuck’s Crushing It, https://amzn.to/2O12UTP and how using some of the tools, tips and tricks (had to throw that in of course!) that they share in their books, I’ve been able to completely change my life, and you can do the same too. It all starts with taking action and following your dreams, it doesn’t have to be right, not at all, but learning and improving are part of the process of anything that you become successful at. Does Defending an Options Trade Gone Wrong Make Sense? On today’s episode I share several stories and explain why it doesn’t always make sense to defend an options trade gone wrong. This could be controversial and everyone has their own risk tolerances but I thought it would make sense to share some of my experiences with trying to reduce a trade’s risk by using defensive measures. Why Should I Make Small Options Trades When I Have All This Leverage? Options give accounts of any size incredible leverage by being able to trade 100 lots of shares for really only pennies on the dollar of the actual shares. But there is so much more to options pricing and the risk involved that an inexperienced trader may not be aware of. Today we cover several reasons why trading small is much more beneficial thank taking that huge risk in one single position. Why Should I Leave Profits and Close An Options Trade Early? My apologies on the audio, I had some unexpected microphone issues and this episode is pure gold anyway 😂. On today’s episode we cover one of the most frequently asked questions by new options traders, why should I close my trade early when there are still profits to be made? Short answer, because profits can quickly disappear with options trading. We go in depth on the three main reasons I consider when closing a trade early. Eddie Ghabour, Managing Partner at Key Advisors Group and Author of The Common Sense Bull: Keys to the Good Life Before And After Retirement (Link to book: https://amzn.to/2Hgsy5H ) joins us today to talk about several actionable strategies that investors of ANY financial level can start implementing today! Taylor and I expand upon our first session together on the podcast going a little deeper in Crypto Trading 102. We discuss more how to trade the Cryptos and Taylor gives us more background on how they use fundamental analysis to select which Crypto will make the grade and make the trade. I’m going to break down the fourth wall here, I am making ads to showcase the podcast and this is the first one! Thank you all so much for the support! I was moved by this conversation I had with JP Bossi (@jpbossi), a member of 10minutestocktrader.com who lives in Argentina and has learned through experience what it takes to survive and thrive in a national currency crisis. I was completely blown away with his situation and his explanation of how he and his people endure near the end is truly heartfelt. I’m very grateful that he has shared this story with the podcast! On today’s podcast I’m sharing my worst investment ever on Andrew Stotz’s podcast called “My Worst Investment Ever.” This is the first time I outline exactly what I did wrong in gold and truthfully, there were a couple of painful points that Andrew brought up, things that I should have known better. But, stories like these are why I make so much content. I want you to learn from my expensive mistakes so that you don’t repeat them and can have some free trading tuition (what it’s called when you blow up your account). On today’s podcast I am exceptionally excited to introduce my new friend, Cuttino Mobley as he has reached out to us to learn how to trade stocks & options. Cuttino played for 11 seasons in the NBA and is now looking to step on the court of Wall Street and learn the trading game! Today we are starting a new segment called Buy the Rumor, Sell the News, trading the headlines. Today the Wall Street Journal reported that the Trump administration is “leading toward backing a bill and says he has options to get more money for project.” If that doesn’t sound like a trade idea, I don’t know what does! On today’s podcast I had the opportunity to be featured on Michael Lamothe’s Instagram Live (@MichaelGLamothe) which we have repurposed into a podcast. Michael and I talk about the nitty gritty around trading options. We cover generating income, liquidity, breakout strategies and creating multiple ways to profit. Throw in creating businesses around your passion and you’ve got one heck of a show! What’s the Difference Between a Simple and Exponential Moving Average? On today’s podcast I dig deep to give you the answers to the difference between a simple and exponential moving average. Moving averages are used by many traders to help identify trends and with the knowledge gained in this podcast, maybe it can help you with creating your own trading strategy. Ok, I had a lot of fun talking with Raghee Horner, the Managing Director of Futures Trading at Simpler Trading. She and I covered a vast array of topics including how spending less time in front of the screen leads to better trading, defensive trades, money supply, futures & forex, the Powell Put and Dow theory. Honestly, this was one of the most enlightening discussions in the macro economic field I’ve had in a while and I’m so thankful for Raghee for coming on the show! I’m resharing the Joe Money Podcast. Please follow Joey at @getjoemoneyright on Instagram. He delivers daily personal financial content to over 150k followers. I’m incredibly grateful that he and I have connected and that he has allowed me to reshare his content with the 10 minute trader community! Grab your copy of Steve’s book New Trader Rich Trader 2 Here: https://amzn.to/2MSpn52 Get the original New Trader Rich Trader Here: https://amzn.to/2D9RGY3 The Next Book in the Series, 50 Moving Averages that Beat Buy & Hold: https://amzn.to/2t2xumt On today’s podcast we have the legend back again, Steve Burns is in studio talking about his book, New Trader Rich Trader 2. We discuss the physiological aspects of trading, how identifying as a trader is ok, but identifying as a trade, especially gone wrong is a terrible idea. Steve and I have a heart to heart about options trading and we have a quick discussion about Trump. In today’s episode we go over the FB earnings announcement and teach you how to calculate the expected move of any stock over any time frame. In today’s podcast we talk about $AAPL earnings and how to play those as well as the Fed and the current yield curve inversion. On today’s podcast we talk about the perfect trading system and how it doesn’t exist. But you can create your own system that fits your own trading style and personality that perfectly fits you! Today’s episode is a lot more casual than usual. I really just wanted to say thank you for letting me be a part of your day, share the direction of the podcast and my most embarrassing public speaking story ever. Be sure to stay to the end for the story! On today’s podcast the legend returns Steve Burns (@sjosephburns) to discuss his book New Trader Rich Trader (https://amzn.to/2shLcS7). We cover all kinds of topics including risk management, position sizing, trading with a plan and even the rapper 6ix9ine. This is not one to miss as even after 10 years of trading, I had a ton of takeaways from this book! Links mentioned in podcast 1. ETFReplay.com 2.Stockcharts.com 3. New Trader Rich Trader 2 https://amzn.to/2T6w3ie Thank you so much for tuning into the How To Trade Stocks And Options Podcast by 10minutestocktrader.com If you feel that I’ve brought you any value at all, please consider showing your appreciation by becoming a supporter of this free podcast at http://anchor.fm/Christopher-Uhl/support. This allows me to be able to create more content and give you more value! On today’s podcast, Danielle Shay, Director of Options at Simpler Trading joins us to talk about the overall direction of the market and her thoughts on the upcoming earnings season. Links mentioned in the show: 1. CMLviz.com 2. FiveStarTrader.com Thank you so much for tuning into the How To Trade Stocks And Options Podcast by 10minutestocktrader.com If you feel that I’ve brought you any value at all, please consider showing your appreciation by becoming a supporter of this free podcast at http://anchor.fm/Christopher-Uhl/support. This allows me to be able to create more content and give you more value! Very honored to have Taylor Letterman on the line today from Simpler Trading. Taylor comes from a tech background and was recruited to trade cryptos in 2016. His vast wealth of the subject is apparent and he graciously walks us through the absolute basics for how to get started trading crypto currencies. If you ever wanted to get into this area, Taylor is the man to go to! Thank you so much for tuning into the How To Trade Stocks And Options Podcast by 10minutestocktrader.com. If you feel that I’ve brought you any value at all, please consider showing your appreciation by becoming a supporter of this free podcast at http://anchor.fm/Christopher-Uhl/support. This allows me to be able to create more content and give you more tools, tips and tricks to trade faster and trade smarter! On this podcast I get a little personal. I share several stories from my past that have helped shape who I am today and through some of my own struggles with self doubt. On today’s podcast I share with you all the types of orders available for placing trades, talk about the perks of each one and give my personal experiences on which I feel is the best kind of order. Thank you so much for tuning into the How To Trade Stocks And Options Podcast by 10minutestocktrader.com. If you feel that I’ve brought you any value at all, please consider showing your appreciation by becoming a supporter of this free podcast at http://anchor.fm/Christopher-Uhl/support. This allows me to be able to create more content and give you more tools, tips and tricks to trade faster and trade smarter! On today’s podcast we talk about 3 easy ways to blow up your account. Now I don’t want you to actually blow up your account, but these are some ways that I’ve lost money and I wanted to share a few tips on how to avoid that happening to your own account. Thank you so much for tuning into the How To Trade Stocks And Options Podcast by 10minutestocktrader.com. If you feel that I’ve brought you any value at all, please consider showing your appreciation by becoming a supporter of this free podcast at http://anchor.fm/Christopher-Uhl/support. This allows me to be able to create more content and give you more tools, tips and tricks to trade faster and trade smarter! On today’s episode we took a headline from the Wall Street Journal and turned it into a high probability trade idea! Thank you so much for tuning into the How To Trade Stocks And Options Podcast by 10minutestocktrader.com. If you feel that I’ve brought you any value at all, please consider showing your appreciation by becoming a supporter of this free podcast at http://anchor.fm/Christopher-Uhl/support. This allows me to be able to create more content and give you more tools, tips and tricks to trade faster and trade smarter! On today’s episode we talk about how entry and exit points, thought to be the holy grail of importance by new traders is actually much easier than you would think if you change up your trading style. Thank you so much for tuning into the How To Trade Stocks And Options Podcast by 10minutestocktrader.com. If you feel that I’ve brought you any value at all, please consider showing your appreciation by becoming a supporter of this free podcast at http://anchor.fm/Christopher-Uhl/support. This allows me to be able to create more content and give you more tools, tips and tricks to trade faster and trade smarter! I’ve been reading Steve Burns’ book, New Trader Rich Trader: https://amzn.to/2shLcS7 in preparation for an interview with him and came across a chapter on trade rules. I thought this would be a great time to share some of Steve’s rules and some of my own to help you trade faster and trade smarter! Thank you so much for tuning into the How To Trade Stocks And Options Podcast by 10minutestocktrader.com. If you feel that I’ve brought you any value at all, please consider showing your appreciation by becoming a supporter of this free podcast at http://anchor.fm/Christopher-Uhl/support. This allows me to be able to create more content and give you more tools, tips and tricks to trade faster and trade smarter! On today’s episode we have the former teen trader, Adriel Solorzano back on the podcast to talk about all the tools, tips and tricks he uses in order to actively trade a stock and options portfolio as a full time college student. Links mentioned in podcast: 1. Steve Burns’ book, New Trader Rich Trader: https://amzn.to/2shLcS7 2. How to Lose Money Trading Derivatives http://eprints.lse.ac.uk/61219/1/sp-2.pdf. Thank you so much for tuning into the How To Trade Stocks And Options Podcast by 10minutestocktrader.com. If you feel that I’ve brought you any value at all, please consider showing your appreciation by becoming a supporter of this free podcast at http://anchor.fm/Christopher-Uhl/support. This allows me to be able to create more content and give you more tools, tips and tricks to trade faster and trade smarter! Today we cover the remaining Option Greeks and talk about how they relate to one another and your own portfolio. Thank you so much for tuning into the How To Trade Stocks And Options Podcast by 10minutestocktrader.com. If you feel that I’ve brought you any value at all, please consider showing your appreciation by becoming a supporter of this free podcast at http://anchor.fm/Christopher-Uhl/support. This allows me to be able to create more content and give you more tools, tips and tricks to trade faster and trade smarter! On today’s episode we talk about how to Beta Weight a portfolio and what that even means. It gives you an idea of your overall market risk associated with your underlying portfolio components. Tune in to learn more! Thank you so much for tuning into the How To Trade Stocks And Options Podcast by 10minutestocktrader.com. If you feel that I’ve brought you any value at all, please consider showing your appreciation by becoming a supporter of this free podcast at http://anchor.fm/Christopher-Uhl/support. This allows me to be able to create more content and give you more tools, tips and tricks to trade faster and trade smarter! On today’s episode I talk about the newest feature at 10minutestocktrader.com, the small account challenge. We are limiting our capital and will be putting on several strategies in order to potentially reach incredible returns, all while taking as small of risk as possible. This is one you definitely want to follow this year! Today we are still in our Greek series and we are talking about Vega. This is a key tool in the options pricing model and works well for both buyers and sellers, if they are on the right side of the current vega. Tune in to learn more! Thank you so much for tuning into the How To Trade Stocks And Options Podcast by 10minutestocktrader.com. If you feel that I’ve brought you any value at all, please consider showing your appreciation by becoming a supporter of this free podcast at http://anchor.fm/Christopher-Uhl/support. This allows me to be able to create more content and give you more tools, tips and tricks to trade faster and trade smarter! On today’s episode we dive deep into the time value of theta and how it relates to an option’s pricing. Thank you so much for tuning into the How To Trade Stocks And Options Podcast by 10minutestocktrader.com If you feel that I’ve brought you any value at all, please consider showing your appreciation by becoming a supporter of this free podcast at http://anchor.fm/Christopher-Uhl/support. This allows me to be able to create more content and give you more value! Options trading can be complicated, especially when you’re talking about all the different pricing models that go into creating the prices shown on your trade screen. In today’s episode we go in depth on Delta and talk about 3 different ways to use Delta within your own portfolio. Thank you so much for tuning into the How To Trade Stocks And Options Podcast by 10minutestocktrader.com. If you feel that I’ve brought you any value at all, please consider showing your appreciation by becoming a supporter of this free podcast at http://anchor.fm/Christopher-Uhl/support. This allows me to be able to create more content and give you more tools, tips and tricks to trade faster and trade smarter! On today’s podcast I do my best to recount and explain as much as I could from an interview I conducted with Danielle Shay who is the director of Options at Simpler Trading. Somewhere in the Skype clouds the audio was lost. There’s no way I could do justice to Danielle’s knowledge and expertise that she was kind enough to share with the podcast audience. Hopefully we can have her on the show again soon. Thank you so much for tuning into the How To Trade Stocks And Options Podcast by 10minutestocktrader.com. If you feel that I’ve brought you any value at all, please consider showing your appreciation by becoming a supporter of this free podcast at http://anchor.fm/Christopher-Uhl/support. This allows me to be able to create more content and give you more tools, tips and tricks to trade faster and trade smarter! Link to Steve’s newest book: https://amzn.to/2GUYJsO I cannot describe how grateful I am that I was able to interview the legendary Steve Burns for the How to Trade Stocks and Options Podcast. Steve comes from over 2 decades of trading experience and has written over 20 books and has been able to garner close to 200k very loyal social media followers. Steve is a true blueprint for what a successful trader looks like. Trust me, the next 43 minutes will be better than your first child being born (well maybe not that far, but it’s going to be great!!!) Thank you so much for tuning into the How To Trade Stocks And Options Podcast by 10minutestocktrader.com. If you feel that I’ve brought you any value at all, please consider showing your appreciation by becoming a supporter of this free podcast at http://anchor.fm/Christopher-Uhl/support. This allows me to be able to create more content and give you more tools, tips and tricks to trade faster and trade smarter! Banks, Artificial Intelligence and Ironing My Shirt? Today is different than most, I’m prepping for a filming day for my day job. Looking forward to it but didn’t want to leave the podcast listeners out so I brought you along as I prep for the day! Thank you so much for tuning into the How To Trade Stocks And Options Podcast by 10minutestocktrader.com. If you feel that I’ve brought you any value at all, please consider showing your appreciation by becoming a supporter of this free podcast at http://anchor.fm/Christopher-Uhl/support. This allows me to be able to create more content and give you more tools, tips and tricks to trade faster and trade smarter! In today’s episode I go pretty deep into bonds, what the fed funds rate is, convexity, Trump and a Lamborghini. Not one to miss for sure! Thank you so much for tuning into the How To Trade Stocks And Options Podcast by 10minutestocktrader.com. If you feel that I’ve brought you any value at all, please consider showing your appreciation by becoming a supporter of this free podcast at http://anchor.fm/Christopher-Uhl/support. This allows me to be able to create more content and give you more tools, tips and tricks to trade faster and trade smarter! In today’s episode I give 3 tips to avoid being assigned shares when you sell options. I’ve had it happen several times and share my experiences on how to avoid the assignment and how to deal with it if it does happen. Thank you so much for tuning into the How To Trade Stocks And Options Podcast by 10minutestocktrader.com. If you feel that I’ve brought you any value at all, please consider showing your appreciation by becoming a supporter of this free podcast at http://anchor.fm/Christopher-Uhl/support. This allows me to be able to create more content and give you more tools, tips and tricks to trade faster and trade smarter! So Goldman Sachs (GS) had money laundering charges filed against the financial firm by the country of Malaysia. Usually when something like this happens I can only imagine which way the stock price will move. But even if I’m wrong, here’s a trade idea that will profit if GS goes up (to a point), down or nowhere at all. Thank you so much for tuning into the How To Trade Stocks And Options Podcast by 10minutestocktrader.com. If you feel that I’ve brought you any value at all, please consider showing your appreciation by becoming a supporter of this free podcast at http://anchor.fm/Christopher-Uhl/support. This allows me to be able to create more content and give you more tools, tips and tricks to trade faster and trade smarter! Stocks are now in correction territory, in today’s show we go over how I’m structuring my portfolio and gives couple trade ideas for the week to come. Thank you so much for tuning into the How To Trade Stocks And Options Podcast by 10minutestocktrader.com. If you feel that I’ve brought you any value at all, please consider showing your appreciation by becoming a supporter of this free podcast at http://anchor.fm/Christopher-Uhl/support. This allows me to be able to create more content and give you more tools, tips and tricks to trade faster and trade smarter! Today I am sharing an interview I did with William Sattree, a former educator for high net worth individuals, teaching them how to trade their own portfolios. I am incredibly grateful that he has chosen to share his insights with us! Thank you so much for tuning into the How To Trade Stocks And Options Podcast by 10minutestocktrader.com. If you feel that I’ve brought you any value at all, please consider showing your appreciation by becoming a supporter of this free podcast at http://anchor.fm/Christopher-Uhl/support. This allows me to be able to create more content and give you more tools, tips and tricks to trade faster and trade smarter! 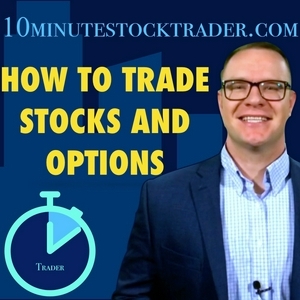 In today’s episode I talk about probably my favorite characteristic of options trading and that’s the fact that you can be completely wrong on a trade directionally, but because of the pricing structure of options, that trade could still profit. Tune in to learn more! Thank you so much for tuning into the How To Trade Stocks And Options Podcast by 10minutestocktrader.com If you feel that I’ve brought you any value at all, please consider showing your appreciation by becoming a supporter of this free podcast at http://anchor.fm/Christopher-Uhl/support. This allows me to be able to create more content and give you more value! In today’s episode we take a look at three different ways to trade a news event using options. Verizon has had some news come out about it’s digital content so I thought this would be the perfect example of how to set these trades up. You’ll be surprised at the outcome as only one of the three looked appealing as a trade to me! Thank you so much for tuning into the How To Trade Stocks And Options Podcast by 10minutestocktrader.com If you feel that I’ve brought you any value at all, please consider showing your appreciation by becoming a supporter of this free podcast at http://anchor.fm/Christopher-Uhl/support. This allows me to be able to create more content and give you more value! Today I wanted to share a tip with you about finding the right amount of balance between risk and reward in options trades. I use this method of balancing the probability of profit with the max risk on every trade that I enter. This tells me with just a quick glance if the options pricing is suitable for my risk tolerance and if I am being adequately compensated in the trade by placing my strikes at these levels. Thank you so much for tuning into the How To Trade Stocks And Options Podcast by 10minutestocktrader.com If you feel that I’ve brought you any value at all, please consider showing your appreciation by becoming a supporter of this free podcast at http://anchor.fm/Christopher-Uhl/support. This allows me to be able to create more content and give you more value! Last week we talked about what an inverted yield curve is, but what is causing this to happen now? Thank you so much for tuning into the How To Trade Stocks And Options Podcast by 10minutestocktrader.com If you feel that I’ve brought you any value at all, please consider showing your appreciation by becoming a supporter of this free podcast at http://anchor.fm/Christopher-Uhl/support. This allows me to be able to create more content and give you more value! What were you doing when you were 11? Well Adriel was cracking books and finding resources on how to trade. His personal story is such an inspiration! Tune in to hear just how knowledgeable this young man is at only 19, I cannot wait to have him on again, (he can probably teach me a few things too!) Thank you so much for tuning into the How To Trade Stocks And Options Podcast by 10minutestocktrader.com If you feel that I’ve brought you any value at all, please consider showing your appreciation by becoming a supporter of this free podcast at http://anchor.fm/Christopher-Uhl/support. This allows me to be able to create more content and give you more value! Dow Jones Down Nearly 500, Is There a Trade? Does this mean that we have entered into a bear market? (N0) But the news spooked investors this week with all the major indices down over 4%. Thank you so much for tuning into the How To Trade Stocks And Options Podcast by 10minutestocktrader.com If you feel that I’ve brought you any value at all, please consider showing your appreciation by becoming a supporter of this free podcast at http://anchor.fm/Christopher-Uhl/support. This allows me to be able to create more content and give you more value! You’ve probably heard about it in the news, and I wanted to make a quick podcast doing my best to explain it in a short format. I’ll be putting together a bigger, longer, more in depth episode in the near future. Thank you so much for tuning into the How To Trade Stocks And Options Podcast by 10minutestocktrader.com If you feel that I’ve brought you any value at all, please consider showing your appreciation by becoming a supporter of this free podcast at http://anchor.fm/Christopher-Uhl/support. This allows me to be able to create more content and give you more value! It happens to pretty much anyone, you’ve got a bullish put spread on and the next thing you know, you’re losing money and the strikes are being tested. Today I cover 3 easy adjustments I use in my own portfolio to manage the risk on these types of trades gone wrong. Thank you so much for tuning into the How To Trade Stocks And Options Podcast by 10minutestocktrader.com If you feel that I’ve brought you any value at all, please consider showing your appreciation by becoming a supporter of this free podcast at http://anchor.fm/Christopher-Uhl/support. This allows me to be able to create more content and give you more value! In today’s episode I put on a trade in EWW that has a 72% probability of profit, and I did it faster than it took you to read this description. Thank you so much for tuning into the How To Trade Stocks And Options Podcast by 10minutestocktrader.com If you feel that I’ve brought you any value at all, please consider showing your appreciation by becoming a supporter of this free podcast at http://anchor.fm/Christopher-Uhl/support. This allows me to be able to create more content and give you more value! I recently was interviewed by the First Class Trade Talks podcast and wanted to share it with my audience. We go over the day I figured out I could be a trader, my trading style and mistakes that you all could learn from too! I think it’s a great one (but I’m a little biased lol). Thank you so much for tuning into the How To Trade Stocks And Options Podcast by 10minutestocktrader.com If you feel that I’ve brought you any value at all, please consider showing your appreciation by becoming a supporter of this free podcast at http://anchor.fm/Christopher-Uhl/support. This allows me to be able to create more content and give you more value! A lot of options traders will tell you that if you’re selling options, the only way to make money is by trading undefined risk. I’m here to tell you that is just not true. Yes, trading undefined risk trades will allow your profits to come faster as premium decays, but if you’re wrong and trade goes against you, you could see what would be a 200 or so loss turn into a 2000 loss, all of that could have been avoided by taking the risk off the table by defining your risk. Thank you so much for tuning into the How To Trade Stocks And Options Podcast by 10minutestocktrader.com If you feel that I’ve brought you any value at all, please consider showing your appreciation by becoming a supporter of this free podcast at http://anchor.fm/Christopher-Uhl/support. This allows me to be able to create more content and give you more value! After looking at the options in GM, it is apparent there is an opportunity to profit several ways on the stock. First, the ex-dividend date is December 6 and with earnings not until February (which could lead to additional volatility), this seems like it could be an ideal candidate for a covered call. Thank you so much for tuning into the How To Trade Stocks And Options Podcast by 10minutestocktrader.com If you feel that I’ve brought you any value at all, please consider showing your appreciation by becoming a supporter of this free podcast at http://anchor.fm/Christopher-Uhl/support. This allows me to be able to create more content and give you more value! Wall Street Report Podcast Ep 152 Thank you so much for tuning into the How To Trade Stocks And Options Podcast by 10minutestocktrader.com If you feel that I’ve brought you any value at all, please consider showing your appreciation by becoming a supporter of this free podcast at http://anchor.fm/Christopher-Uhl/support. This allows me to be able to create more content and give you more value! Wall Street Report Podcast Ep. 151 Thank you so much for tuning into the How To Trade Stocks And Options Podcast by 10minutestocktrader.com If you feel that I’ve brought you any value at all, please consider showing your appreciation by becoming a supporter of this free podcast at http://anchor.fm/Christopher-Uhl/support. This allows me to be able to create more content and give you more value! With options, it’s imperative to size your risk correctly, it can lead to major issues of you decide to go big or go home... Thank you so much for tuning into the How To Trade Stocks And Options Podcast by 10minutestocktrader.com If you feel that I’ve brought you any value at all, please consider showing your appreciation by becoming a supporter of this free podcast at http://anchor.fm/Christopher-Uhl/support. This allows me to be able to create more content and give you more value! Options trading allows traders to target specific probabilities of profit when making trades. But it can be unnerving when something moves against a trade you’ve put on, by trusting the process you can let the probabilities play out and hopefully profit! Thank you so much for tuning into the How To Trade Stocks And Options Podcast by 10minutestocktrader.com If you feel that I’ve brought you any value at all, please consider showing your appreciation by becoming a supporter of this free podcast at http://anchor.fm/Christopher-Uhl/support. This allows me to be able to create more content and give you more value! Lesson 7 in the How To Trade Stocks and Options course available at 10minutestocktrader.com. Thank you so much for tuning into the How To Trade Stocks And Options Podcast by 10minutestocktrader.com If you feel that I’ve brought you any value at all, please consider showing your appreciation by becoming a supporter of this free podcast at http://anchor.fm/Christopher-Uhl/support. This allows me to be able to create more content and give you more value! Wall Street Report Podcast Ep. 148 Thank you so much for tuning into the How To Trade Stocks And Options Podcast by 10minutestocktrader.com If you feel that I’ve brought you any value at all, please consider showing your appreciation by becoming a supporter of this free podcast at http://anchor.fm/Christopher-Uhl/support. This allows me to be able to create more content and give you more value! Wall Street Report Ep. 147 Thank you so much for tuning into the How To Trade Stocks And Options Podcast by 10minutestocktrader.com If you feel that I’ve brought you any value at all, please consider showing your appreciation by becoming a supporter of this free podcast at http://anchor.fm/Christopher-Uhl/support. This allows me to be able to create more content and give you more value! What’s the difference between Implied Volatility Rank and Percentile? Today we have David Lero back on the phone to discuss the differences between the two. I’ll be honest, I didn’t know they were different and you can hear the moment when it finally clicks for me. Thanks so much to tuning into today’s episode!!! Thank you so much for tuning into the How To Trade Stocks And Options Podcast by 10minutestocktrader.com If you feel that I’ve brought you any value at all, please consider showing your appreciation by becoming a supporter of this free podcast at http://anchor.fm/Christopher-Uhl/support. This allows me to be able to create more content and give you more value! Wall Street Report Ep. 143 Thank you so much for tuning into the How To Trade Stocks And Options Podcast by 10minutestocktrader.com If you feel that I’ve brought you any value at all, please consider showing your appreciation by becoming a supporter of this free podcast at http://anchor.fm/Christopher-Uhl/support. This allows me to be able to create more content and give you more value! Wall Street Report Podcast Ep. 142 Thank you so much for tuning into the How To Trade Stocks And Options Podcast by 10minutestocktrader.com If you feel that I’ve brought you any value at all, please consider showing your appreciation by becoming a supporter of this free podcast at http://anchor.fm/Christopher-Uhl/support. This allows me to be able to create more content and give you more value! Wall Street Report Podcast Ep. 141 Thank you so much for tuning into the How To Trade Stocks And Options Podcast by 10minutestocktrader.com If you feel that I’ve brought you any value at all, please consider showing your appreciation by becoming a supporter of this free podcast at http://anchor.fm/Christopher-Uhl/support. This allows me to be able to create more content and give you more value! On Today’s Episode of the How to Trade Stocks and Options Podcast, we have David Lero on the phone. David is the VP and Head Options Strategist of the ROC Investment Group based in Kansas City, Kansas. David has been trading for decades and has graciously contributed articles on Implied Volatility to http://10minutestocktrader.com. Today we are going over the first article in his series, Understanding Implied Volatility Rank. Thank you so much for tuning into the How To Trade Stocks And Options Podcast by 10minutestocktrader.com If you feel that I’ve brought you any value at all, please consider showing your appreciation by becoming a supporter of this free podcast at http://anchor.fm/Christopher-Uhl/support. This allows me to be able to create more content and give you more value! Wall Street Report Podcast Ep. 140 Thank you so much for tuning into the How To Trade Stocks And Options Podcast by 10minutestocktrader.com If you feel that I’ve brought you any value at all, please consider showing your appreciation by becoming a supporter of this free podcast at http://anchor.fm/Christopher-Uhl/support. This allows me to be able to create more content and give you more value! Wall Street Report Ep. 139 Thank you so much for tuning into the How To Trade Stocks And Options Podcast by 10minutestocktrader.com If you feel that I’ve brought you any value at all, please consider showing your appreciation by becoming a supporter of this free podcast at http://anchor.fm/Christopher-Uhl/support. This allows me to be able to create more content and give you more value! It’s Not Clickbait, today we go over 2 non traditional and potentially controversial ways to trade earnings announcements. Thank you so much for tuning into the How To Trade Stocks And Options Podcast by 10minutestocktrader.com If you feel that I’ve brought you any value at all, please consider showing your appreciation by becoming a supporter of this free podcast at http://anchor.fm/Christopher-Uhl/support. This allows me to be able to create more content and give you more value! Wall Street Report Ep. 137 Thank you so much for tuning into the How To Trade Stocks And Options Podcast by 10minutestocktrader.com If you feel that I’ve brought you any value at all, please consider showing your appreciation by becoming a supporter of this free podcast at http://anchor.fm/Christopher-Uhl/support. This allows me to be able to create more content and give you more value! In today’s episode we go over how you can structure your portfolio to work like a casino. Yes, it’s true! Thank you so much for tuning into the How To Trade Stocks And Options Podcast by 10minutestocktrader.com If you feel that I’ve brought you any value at all, please consider showing your appreciation by becoming a supporter of this free podcast at http://anchor.fm/Christopher-Uhl/support. This allows me to be able to create more content and give you more value! Are Bonds Luring Investors From Stocks? Wall Street Report Ep. 134 Thank you so much for tuning into the How To Trade Stocks And Options Podcast by 10minutestocktrader.com If you feel that I’ve brought you any value at all, please consider showing your appreciation by becoming a supporter of this free podcast at http://anchor.fm/Christopher-Uhl/support. This allows me to be able to create more content and give you more value! Wall Street Report Ep. 133 Thank you so much for tuning into the How To Trade Stocks And Options Podcast by 10minutestocktrader.com If you feel that I’ve brought you any value at all, please consider showing your appreciation by becoming a supporter of this free podcast at http://anchor.fm/Christopher-Uhl/support. This allows me to be able to create more content and give your more value! Today we are going over 3 ways to avoid getting a pattern day trading violation. This is something that anyone with a margin account with less than $25k should be aware of. Thank you so much for tuning into the How To Trade Stocks And Options Podcast by 10minutestocktrader.com If you feel that I’ve brought you any value at all, please consider showing your appreciation by becoming a supporter of this free podcast at http://anchor.fm/Christopher-Uhl/support. This allows me to be able to create more content and give your more value! What’s better than 1 neutral strategy? Two of course and combining them to have a higher probability of profit! Thank you so much for tuning into the How To Trade Stocks And Options Podcast by 10minutestocktrader.com If you feel that I’ve brought you any value at all, please consider showing your appreciation by becoming a supporter of this free podcast at http://anchor.fm/Christopher-Uhl/support. This allows me to be able to create more content and give your more value! In today’s episode we discuss the 2 legged, multi-month trade known as the calendar spread. Thank you so much for tuning into the How To Trade Stocks And Options Podcast by 10minutestocktrader.com If you feel that I’ve brought you any value at all, please consider showing your appreciation by becoming a supporter of this free podcast at http://anchor.fm/Christopher-Uhl/support. This allows me to be able to create more content and give your more value! In today’s episode we cover the long straddle, that’s buying an at the money call and put at the same strike. Thank you so much for tuning into the How To Trade Stocks And Options Podcast by 10minutestocktrader.com If you feel that I’ve brought you any value at all, please consider showing your appreciation by becoming a supporter of this free podcast at http://anchor.fm/Christopher-Uhl/support. This allows me to be able to create more content and give your more value! Wall Street Report Ep. 131 Thank you so much for tuning into the How To Trade Stocks And Options Podcast by 10minutestocktrader.com If you feel that I’ve brought you any value at all, please consider showing your appreciation by becoming a supporter of this free podcast at http://anchor.fm/Christopher-Uhl/support. This allows me to be able to create more content and give your more value! Today we go over the Iron Butterfly, how it compares to an Iron Condor and the differences in it and a put/call butterfly. Thank you so much for tuning into the How To Trade Stocks And Options Podcast by 10minutestocktrader.com If you feel that I’ve brought you any value at all, please consider showing your appreciation by becoming a supporter of this free podcast at http://anchor.fm/Christopher-Uhl/support. This allows me to be able to create more content and give your more value! The Iron Condor: What’s a Neutral Options Trading Strategy? In today’s episode we are going over the ins and outs of potentially the most popular neutral trading strategy, the Iron Condor. Check out how I use them as well as how I have changed my trading strategy with them! Thank you so much for tuning into the How To Trade Stocks And Options Podcast by 10minutestocktrader.com If you feel that I’ve brought you any value at all, please consider showing your appreciation by becoming a supporter of this free podcast at http://anchor.fm/Christopher-Uhl/support. This allows me to be able to create more content and give your more value! Today I go over a new article I wrote with two trade ideas, one bullish and one bearish in TLT, the 20 year bond ETF. Thank you so much for tuning into the How To Trade Stocks And Options Podcast by 10minutestocktrader.com If you feel that I’ve brought you any value at all, please consider showing your appreciation by becoming a supporter of this free podcast at http://anchor.fm/Christopher-Uhl/support. This allows me to be able to create more content and give your more value! Wall Street Report Ep. 128 Thank you so much for tuning into the How To Trade Stocks And Options Podcast by 10minutestocktrader.com If you feel that I’ve brought you any value at all, please consider showing your appreciation by becoming a supporter of this free podcast at http://anchor.fm/Christopher-Uhl/support. This allows me to be able to create more content and give your more value! Wall Street Report Ep. 127 Thank you so much for tuning into the How To Trade Stocks And Options Podcast by 10minutestocktrader.com If you feel that I’ve brought you any value at all, please consider showing your appreciation by becoming a supporter of this free podcast at http://anchor.fm/Christopher-Uhl/support. This allows me to be able to create more content and give your more value! I was too excited to share my thoughts with you on today’s podcast so I recorded it on the way home. The audio gets weird about 1/2 was through but the message still comes through. Deliver value and don’t ask for anything! Thank you so much for tuning into the How To Trade Stocks And Options Podcast by 10minutestocktrader.com If you feel that I’ve brought you any value at all, please consider showing your appreciation by becoming a supporter of this free podcast at http://anchor.fm/Christopher-Uhl/support. This allows me to be able to create more content and give your more value! Wall Street Report Ep. 126 Thank you so much for tuning into the How To Trade Stocks And Options Podcast by 10minutestocktrader.com If you feel that I’ve brought you any value at all, please consider showing your appreciation by becoming a supporter of this free podcast at http://anchor.fm/Christopher-Uhl/support. This allows me to be able to create more content and give your more value! Wall Street Report Ep. 125 Thank you so much for tuning into the How To Trade Stocks And Options Podcast by 10minutestocktrader.com If you feel that I’ve brought you any value at all, please consider showing your appreciation by becoming a supporter of this free podcast at http://anchor.fm/Christopher-Uhl/support. This allows me to be able to create more content and give your more value! Wall Street Report Ep. 124. Thank you so much for tuning into the How To Trade Stocks And Options Podcast by 10minutestocktrader.com If you feel that I’ve brought you any value at all, please consider showing your appreciation by becoming a supporter of this free podcast at http://anchor.fm/Christopher-Uhl/support. This allows me to be able to create more content and give your more value! Wall Street Report Ep. 123. Thank you so much for tuning into the How To Trade Stocks And Options Podcast by 10minutestocktrader.com If you feel that I’ve brought you any value at all, please consider showing your appreciation by becoming a supporter of this free podcast at http://anchor.fm/Christopher-Uhl/support. This allows me to be able to create more content and give your more value! Wall Street Report Ep. 122. Thank you so much for tuning into the How To Trade Stocks And Options Podcast by 10minutestocktrader.com If you feel that I’ve brought you any value at all, please consider showing your appreciation by becoming a supporter of this free podcast at http://anchor.fm/Christopher-Uhl/support This allows me to be able to create more content and give your more value! In today’s episode we go over one of the easiest bullish trades, the short put spread. With this model, I was able to get over 2 million impressions in 6 months without buying a single ad! News Out of China and New iPhones! New podcast from the article I wrote on moneyandmarkets.com today. In this episode we cover how fear and greed drive markets, black swans and melt-ups and finally 2 easy hedges I use in my own portfolio. There’s so much noise out there, today I go over my top 3 methods I use to stay focused on what really matters to me. Today I cover my 3 ways to defend trades. There’s no cure for a trade gone wrong, but each of these methods could help mitigate and offset at least some of the risk. In today’s episode we have William Sattree back on the program. William has been teaching high net worth individuals how to trade their own portfolios for close to 20 years. We cover managing risk, dealing with drawdowns, mistakes and lessons learned, trade journaling and TastyTrade. Please be sure to rate this podcast and share with those who care! How to Cash in on TSLA CEO’s Latest Bombshell! New article of mine at moneyandmarkets.com. Thanks so much for listening! Thanks for 100 Episodes and more!!!! $12 Billion For Farmers Impacted by the Tariffs! New article today at https://moneyandmarkets.com/three-things-when-placing-trade/ talking about my 3 step process for finding and submitting new options trades. This guy knows his stuff! William has been educating high net worth individuals on options, futures and forex trading for over a decade. He dives right in and tells one of his trading strategies where he takes advantage of price moves in the last hour before an option expires. I truly hope you enjoy listening to this interview as much as I did recording it! Did You See What Happened to NFLX? On this episode, I go over an article I wrote at moneyandmarkets.com/happened-Netflix and talk about the two trade ideas I gave in June and how they were both winners! Today I go over the way I put on a trade, the simple methods I use to find and place trades in just 1-2 minutes each. In this episode we go over 280 different ways, well, really just 3, to trade twitter following its 10% intraday move. Today we go into all the details of the options chain from top to bottom. This one has a lot of visuals so you may want to check out the video as well. Here’s two new trade ideas in SBUX! Today I discuss two high probability options trades leading up to the NFLX earnings announcement. Lesson 3: Why Even Trade Options? In the first lesson of the how to trade Podcast I’ll be introducing myself, giving you some of my background and going over a few of the things I do and don’t trade.